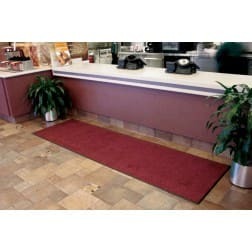 Interior Entrance Mats & Runners - Indoor Carpet Runners | Mats Inc.
Our Perfec Clean Mats & Grates provide a comfortable, surefooted surface that helps eliminate wet, slippery floors caused by tracked in mud, dirt, and water. 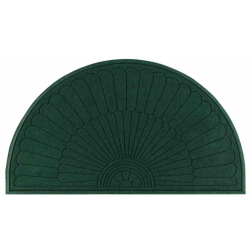 These mats are available in either our exclusive thermoplastic rubber hinge or our standard aluminum hinge. 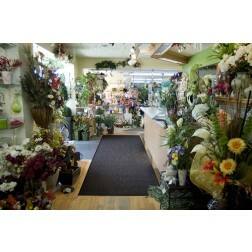 Mats can be recessed or surface mounted. Our grates are manufactured of rigid aluminum rails that allow dirt, sand, and water to collect below the surface. All our floor products are available in a wide range of colors and materials to accent your building design. 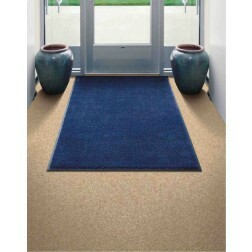 Clear runner matting with tiny "grippers" on the reverse side holds it securely in place, yet won't damage your carpet. It is transparent to let carpet beauty show through. Handsome surface pattern makes it easy to clean. Tapered borders along both edges lay flat to reduce tripping hazards to a minimum. 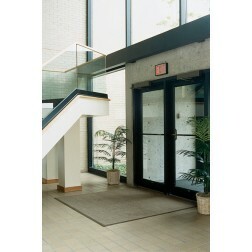 This material is ideal for any type of entrance area, indoors and out. Berber is impervious to ultra-violet light and can be cut into any size or shape without danger of the edges unraveling. Berber is tough as steel, but looks like carpet. 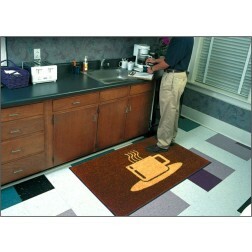 Can be direct glued down or made into custom size mats with edging applied to all sides. Corporate logo or design can be added for a custom look. Email us your artwork for free proof and quote. Like all of our polypropylene matting, Super Berber matting is long wearing and UV stable. It can be used indoor or out. Super Berber can be vacuumed, steam cleaned or hosed off. It can be cut at any angle without danger of the edge unraveling. Available with a smooth backing for recessed application or knob back for free lay application. Custom sizes are available with a high profile vinyl edging applied to all sides. Passes smoke density test ASTM E662. Passes surface flammabilty test FF 1-70 / ASTM D2859. 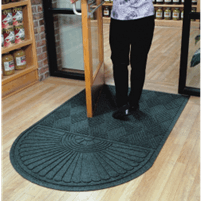 This mat features 17 ounces of 3300 denier, continuous filament Olefin yarn per square yard. Absorbs moisture and dries quickly. 100% Olefin solution-dyed yarns maintain eye catching and attractive color appearance. Designed for medium to heavy duty applications. 10 different shades that coordinate with any interior design. This heavy-duty Olefin mat provides greater wiper service than other customary Olefin mats. 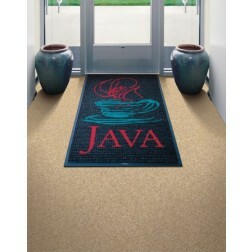 A 65 mil, durable, solid vinyl backing reduces mat movement. 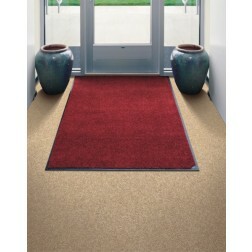 Foam backing is fused to mat to help it stay in place, when placed on top of carpet. 100 percent continuous filament Olefin pile carpet. Solution dyed to resist fading. Traps over one gallon of water per square yard. Deep pile attracts dirt and grime. Two-ply, continuous filament nylon with conductive fibers to drain static electricity away in milliseconds. Stock mats include one installed grounding cord. 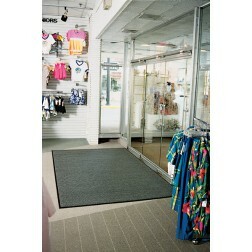 Custom mats require one grounding cord per every 10' of mat. 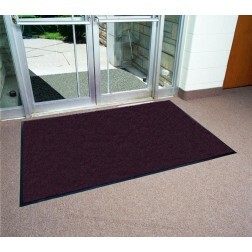 This transitional, wiper/scraper mat removes dirt, grit and moisture before it enters your facility. This mat features 19 ounces per square yard of continuous filament, loop pile olefin combined with polypropylene ribbon yarn in a loop pile construction, to remove dirt and moisture from shoe bottoms, holding it beneath the surface of the mat. Crush-resistant, even under high traffic conditions. Our vibrant colors retain luster even after years of heavy use. 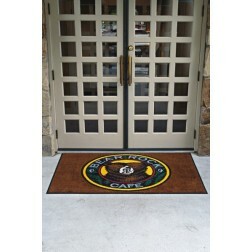 An 80 mil durable, solid vinyl backing reduces mat movement. This premium Olefin wiper mat acts as the final line of defense against dirt and moisture being brought into your facility. Mat features 19 ounces per square yard of continuous filament, loop pile, olefin yarn in a loop pile construction. This mat is crush-resistant, even under high traffic conditions. Vibrant colors retain luster even after years of heavy use. The decorative chevron pattern promotes multi-directional brushing action. The 100% polypropylene needle punch fibers help retain moisture and channel dirt away. Bonded to a durable pvc backing. 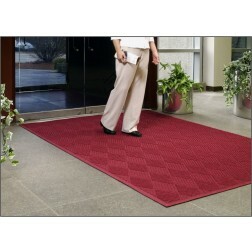 Non-directional, high-low pattern promotes aggressive cleaning action and resists matting down. Solution dyed polypropylene fiber resists staining and color fading for extended service. 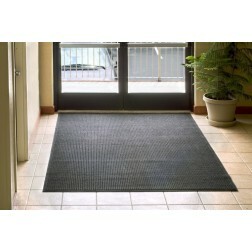 The mat is easily cleaned with a vacuum or hose. 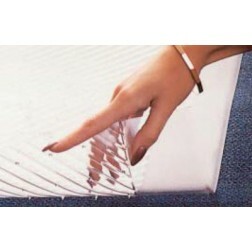 The heavy duty vinyl backing keeps the mat flat and in place. The unique ribbed design traps and hides dirt, yet is easily cleaned. The deep ribbed needle punch is made from 100% polypropylene, which offers exceptional long wear and color fastness. The heavy gauge vinyl backing protects the floor from abrasion and moisture. Heavy 100% anti-static nylon face offers outstanding absorption and durability. Tight, heat-set Ultra-Twist yarn construction resists packing and crushing. Dirt filters into the mat rather than remaining on top. Green friendly SBR rubber backing has 20% recycled rubber content and is available in smooth or cleated backing. Available with oil and grease resistant 100% Nitrile Rubber backing when applications call for additional protection against oil and grease. Outstanding colorfastness. 21 colors available. Pile protected with StainStopper coating to keep mat looking good longer. Easy to clean: Just vacuum or hose off and hang to dry. Use vacuum and extraction cleaning methods as needed. Special lengths up to 60’ are available. See item #2100 Tri-Grip XL for extra wide mat options. 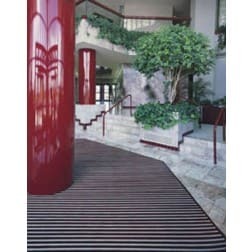 Mats are manufactured from state of the art solution dyed nylon fibers. Yarn is twisted and heat set to enhance dirt and moisture collection. 10 year color-loss guarantee with Indoor use. Mats won't fade due to cleaning. Green friendly rubber backing has 20% recycled rubber content. Available in smooth or cleated backing types. Also available with oil and grease resistant 100% nitrile rubber backing when applications call for additional protection. Certified slip-resistant by the National Floor Safety Institute. Custom sizes available. See #2120 for extra wide mat options. Premium 24 oz/sq. anti-static Polypropylene fiber system dries quickly and won’t fade or rot. When wet, the rubber reinforce surface allows water to be wicked to the bottom of the mat away from foot traffic while providing a slip resistant surface. Rubber reinforced face nubs prevent pile from crushing in high traffic areas, thereby maintaining high performance and extending product life. Solution dyed for excellent color fastness. 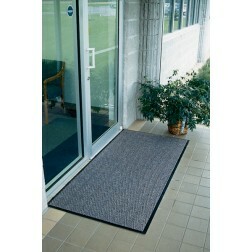 “Water Dam” border keeps dirt and water in the mat and off the floor, minimizing slip hazards and floor damage. Green friendly rubber backing has 20% recycled rubber content and is available in smooth or cleated types. Should not be used in areas exposed to animal fats (kitchens) or petroleum products. Easy to clean: Just vacuum or hose off and hang to dry. Available in either Classic Rubber Border or Fabric Fashion Border design. 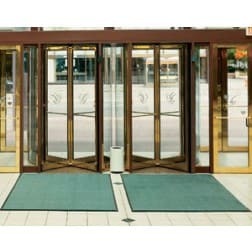 Rubber reinforced face nubs and waffle design provide bi-level crush proof scraping action for years of durable service. Colorfast: Solution dyed for excellent light and wet fastness. Same quality construction as our standard #105 Tri-Grip mat, but in a wider version. Optional 90mil solid rubber backing available. Made from heavy, 100% static dissipative nylon face which offers outstanding absorption and durability. Tight, heat set, Ultra-Twist yarn construction resist packing and crushing. Lutradur™ primary substrate creates a strong bond between the rubber and face. 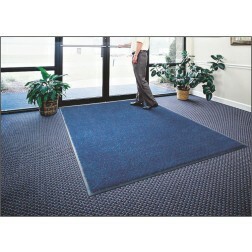 All Tri-Grip mats are slip resistant by the National Floor Safety Institute. When you need an extra wide mat, look at Color Star XL. Made from state of the art solution dyed nylon fibers just like our #125 Color Star mat. 10 year color loss guarantee with indoor use. Available in 7', 8', 9', 10', 11' and 12' widths. 65mil thick solid rubber backing standard. Green friendly backing made from 20% recycled rubber product. Waterhog Eco Grand Elite mats are manufactured with a permanent rubber reinforced bi-level face that will not crush providing years of superior dirt and moisture collection. 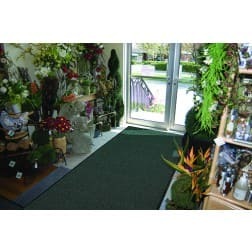 Mats are made with 100% PET Polyester post-consumer recycled fiber made from used plastic bottles for the face and a 100% rubber backing that contains 20% post-consumer recycled tires. Every square foot of a Waterhog Eco Grand Elite mat eliminated 4 half liter bottles from the waste stream. Waterhog Eco Grand Elite mats have a color coordinating fabric border. Every Waterhog Eco Grand Elite mat (except #2246) comes with the universal recycle symbol molded into the face of the mat. 30 ounce face weight, 3/8" thickness, fabric borders, and herringbone pattern. Waterhog Eco Premier mats combine all of the performance of the original WaterHog with a unique diamond face pattern creating the ultimate visual appearance. 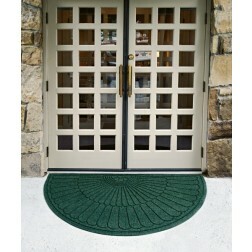 WaterHog Eco Premier mats feature a 100% post-consumer recycled PET face that is reclaimed from plastic bottles. Every 3' x 5' mat diverts approximately 60 plastic bottles from landfills. A multi-denier fiber construction combines thick fibers for scraping with fine fibers for wiping, providing better performance and longer life. The backings of WaterHog Eco Premier mats is made of 100% rubber with 15% to 20% recycled rubber content making these mats our most environmentally friendly mats ever. Indoor/Outdoor: Durable polypropylene face yarn suitable for indoor or outdoor use. Polypropylene fiber system dries quickly preventing fading and rotting. 18 colors available. Place up to 5 colors per mat. Green friendly rubber backing has 20% recycled rubber content. Provides a slip resistant surface which effectively removes tough dirt, grime and water from feet. Anti-static: Waterhog Inlay Logo mats have a maximum average voltage of 1.6 KV as measured by the AATCC 134 Electrostatic Propensity Test and meets IBM’s resistance (NFPA99). 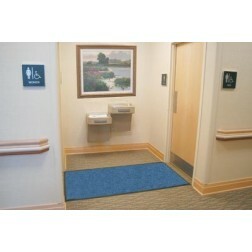 Waterhog mats are safe for use in computer rooms and around electronic equipment. Certified slip resistant by the National Floor Safety Institute. Available in smooth and cleated backing types. Email us your camera ready artwork for a free proof. Premium 24 ounce anti-static Polypropylene fiber system dries quickly and won’t fade or rot. Reproduction of fine details, shading and 3-D images is easily achieved with our state-of-the-art digital printer. 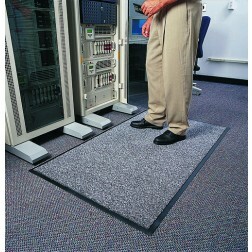 100% premium rubber backing with long-wearing, anti-static nylon carpet for years of trouble-free performance. Green friendly rubber backing has 15% - 20% recycled content. Available with oil/grease resistant 100% Nitrile Rubber backing when applications call for additional protection. LUTRADUR™ primary substrate creates a strong bond between the rubber and carpet. 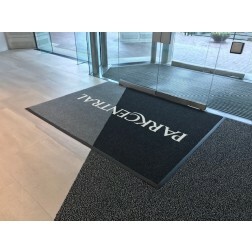 These bright bold mats are a perfect way to capture the attention of your employees and visitors. The applications are endless and they cut down on maintenance costs. Choose from these standard designs or create your own message. Available in cleated or smooth backing.